Found all over South Africa, except in the Great Karoo and in the most northern coastal area of the North Cape. This ones foot/hand combination reminds the most of the homo sapiens. Another similarity, is the fact that its numbers isn't endangered at all! 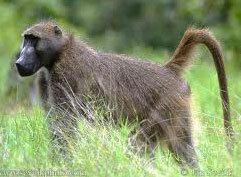 The ape most commonly found in South Africa is the vervet monkey, but the baboon is the largest of them all. Compared to its size, it features one of the largest and most dangerous fangs. Baboons have such close knit social bonds, that they will easily team up to fend of the dangers of a cheetah, python, leopard or, as in some instances recorded, even man! Sometimes, a leopard kills a baboon, is driven from the carcass and only later, after the baboons have left, dare to step in for the remains. A true omnivore, but still, it like to spend its time by overturning stones in their search for some soppy insect or spider. They will even kill small animals when hungry, and is known to be killing almost in the fashion of a pack of wild dogs.In the mating season, the female's bottom swells heavily, an indication that ovulation is about to happen. A female baboon is one of nature's best mothers, with the fathers not far behind in model parenting!